Instructor User Guide StatisticsHow do I modify preferences in the Statistics tool? Set your site preferences for reports. Zoom: Set your site preferences for reports. Check the boxes next to the items you want to select. List only tools available in site will automatically filter the list of tools presented on the Report editing page with the tools available in site. Display item labels on bar charts: This option will display labels with total values on charts that don't require labels to be shown (e.g., Pie charts always require values to be displayed). Charts alpha-transparency: This option allows to specify a transparency level for rendered charts. 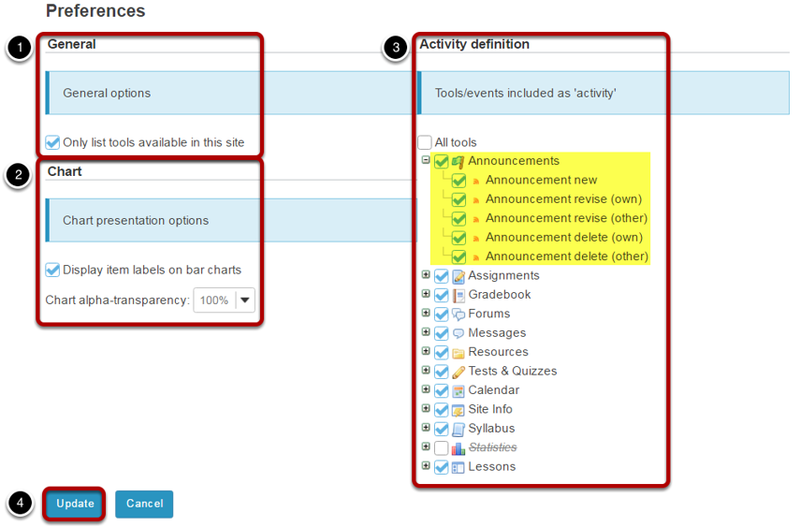 Tools/events processed as 'Activity': This option allows to select the tool events that will count as Activity on the tool Overview page. Clicking on All tools will always use all existing tool events. Since tools can be added/removed from a site or made available/unavailable on current instance, this option ensures that all tools are always selected. Clicking on a Tool will select/unselect all related tool events. Clicking on a Event will select/unselect only that event. Click Update to save your settings. Note: You also may click the + symbol next to individual tools to expand and show distinct events within a given tool. Prev: How do I export a report? Next: What is the Syllabus tool?